It’s time for ‘Japan by Prefecture‘ again! This is the series that aims to provide the highlights of each prefecture of Japan, along with my personal favourites and suggestions from readers. This week, we’re looking at Kagawa (香川県). Kagawa Prefecture is located on the island of Shikoku (四国), the smallest of Japan’s four main islands. The capital is Takamatsu (高松市). Thanks to Artemis, Zooming Japan, Japan Australia and Paul for contributing to this week’s post with lots of great ideas! 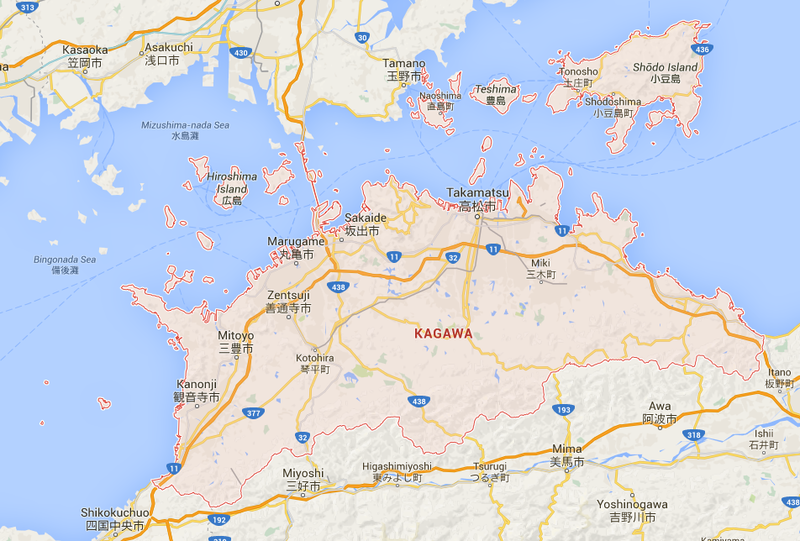 I’ve not been to Kagawa Prefecture yet, but I will be visiting soon, and I’m very excited! Kagawa Prefecture is the smallest of Shikoku’s four prefectures, but probably the prefecture with the most going for it. My personal number one highlight has to be Naoshima (直島). Naoshima, also known as the ‘art island’ is pretty much top of my list of places to visit in Shikoku, and I’m very excited to be spending a night there in December at the island’s famous Benesse House (ホテル ベネッセハウス), which is both a hotel and an art museum, designed by architect Tadao Ando (安藤 忠雄). 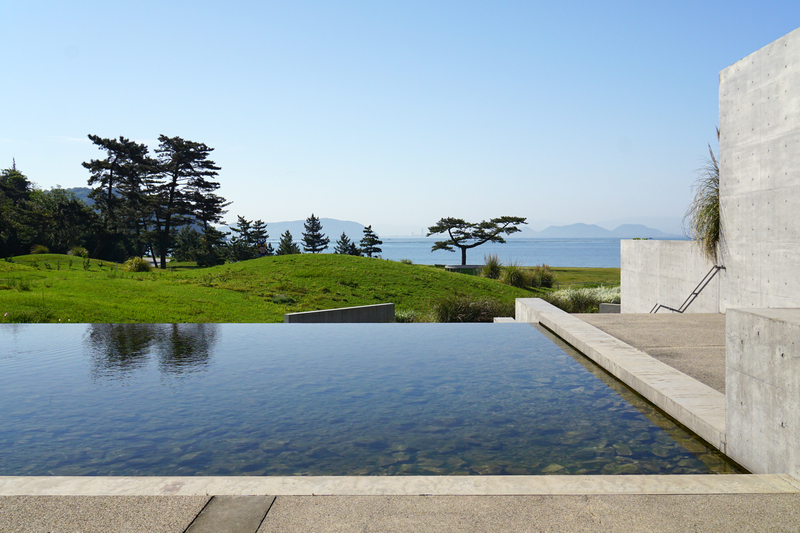 Naoshima is an island in the Seto Inland Sea (瀬戸内海) that is full of public art, sculptures and modern art museums. As well as Benesse House, there’s the Chichu Museum, Lee Ufan Museum and Ando Museum. Scattered around the island is a collection of abandoned houses, workshops, a temple and a shrine that have been converted into art installations and venues for contemporary art, known as the Art House Project. Also on the island is a public bath house which doubles up as an art installation, called I Love Yu (‘yu’ means ‘water’ in Japanese). 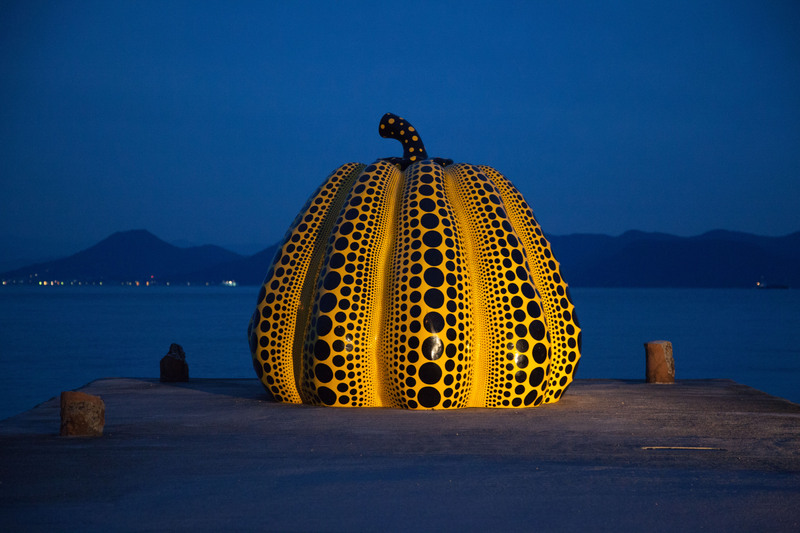 One of the most famous pieces of art on the island is the iconic yellow pumpkin by dotty Japanese artist Yayoi Kusama (草間 彌生) which stands at the end of a pier looking out to sea. Kotohira (琴平) is another place in Kagawa Prefecture that I’m very excited about visiting. Kotohira is most famous for the shrine, Kompirasan (also known as Kotohira Shrine or Kotohira-gu / 金刀比羅宮). This shrine is dedicated to sailors and seafaring, and is said to have one of the most difficult shrine approaches, consisting of 1,368 stone steps (wish me luck!). 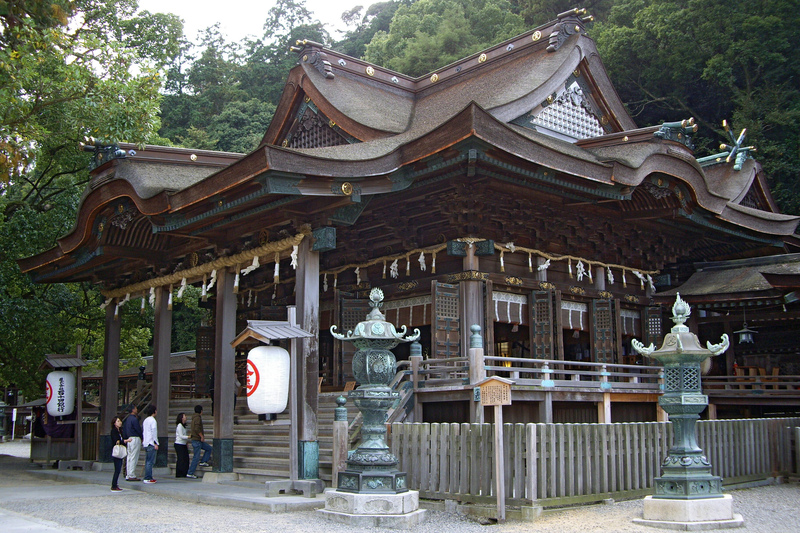 Although officially declared a shrine in the Meiji Period (1868 – 1912), Kompirasan has many features which bear resemblance to those found at a Buddhist temple, making it quite unique. Another place worth visiting in Kagawa Prefecture is Marugame (丸亀). Marugame is a port city (I love a port city!) located just west of the Seto Ohashi Bridge (瀬戸大橋) which connects Shikoku to Japan’s main island of Honshu. Marugame is the second largest city in the prefecture, and also includes many of the Shiwaku Islands (塩飽諸島) which lie just off the nearby coast. Along with Naoshima and Teshima, a number of the Shiwaku Islands serve as festival venues for the Setouchi Triennale (an art festival which next occurs in 2016). 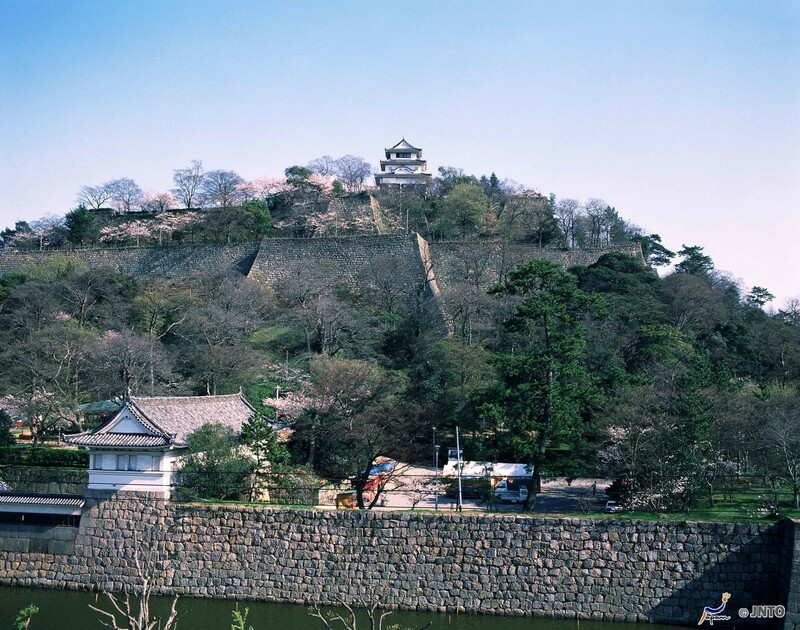 Marugame has a castle (Marugame Castle / 丸亀城), which sits high up on a hill overlooking the city. This castle is one of only 12 original castles in Japan, built between 1597 and 1602. Of course, the capital city of Kagawa Prefecture, Takamatsu (高松), is worth a visit too. A port town and former castle town, Takamatsu’s main attraction now is Ritsurin Garden (栗林公園). Whilst not one of the official top three gardens in Japan, this popular, historical garden surely comes a close fourth. 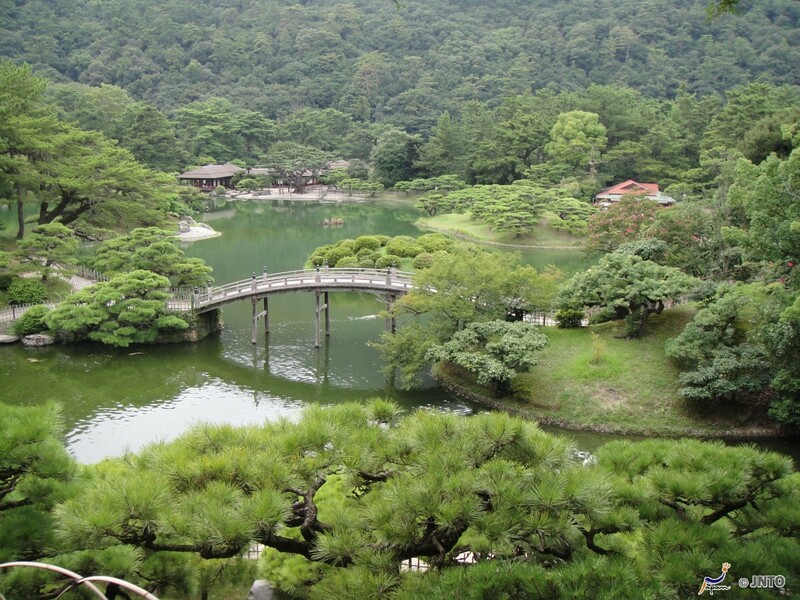 Construction of Ritsurin Garden began in the 1620s, and it was completed in 1745. The garden was opened to the public in 1875. The garden is also home to the Sanuki Folk Craft Museum (The Sanuki Province (讃岐国) was the old name for Kagawa), which contains displays of various folk crafts and art, as well as items for sale. Finally, whilst I don’t usually have a particular feature on the food of the prefecture, I felt I had to just mention Sanuki Udon (讃岐うどん). 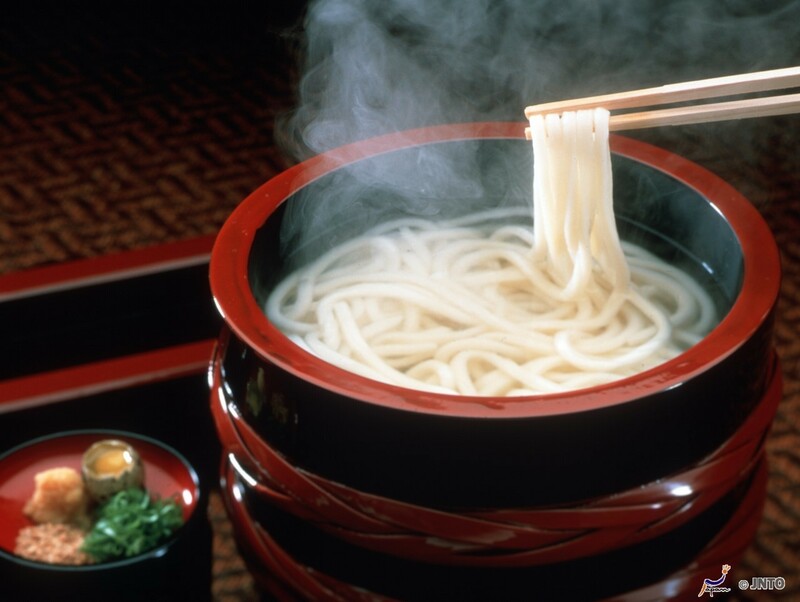 Sanuki Udon is a type of udon noodles which are popular in Shikoku, and especially in Kagawa. They are characterised by their square shape and flat edges, and are usually served as a noodle soup with a broth made from dashi. I know what I’ll be eating in Shikoku! 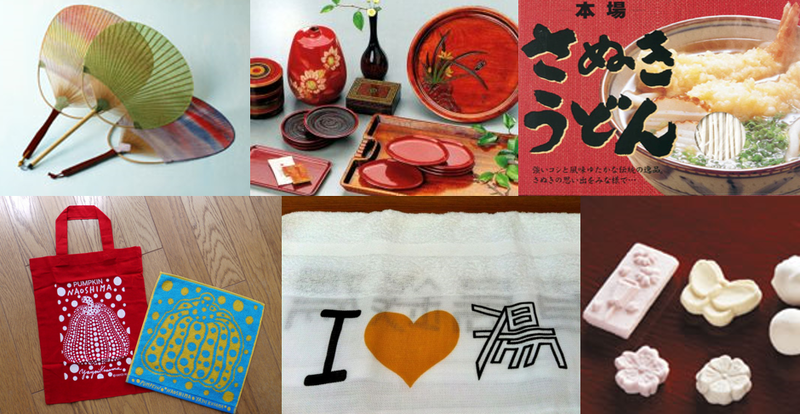 Kagawa Prefecture’s souvenirs (or ‘omiyage’ / おみやげ) consist of traditional folk crafts, paper fans, and of course various sweets and snacks. You can also buy Sanuki Udon to take home if you want to! Marugame makes up 90% of the total production of paper fans in all of Japan, and a lot of Japanese lacquer ware is also made in Kagawa Prefecture. Of course, Naoshima is home to a lot of interesting souvenirs – from things covered in dotty pumpkins, to I Love Yu towels and bath goods. Finally, at Ritsurin Garden you can try all sorts of Japanese traditional sweets. The sweet most popular in this area is ‘sanbonto’, which is a kind of high-grade sugar candy. Next week I will be writing about Ehime (愛媛県). Have you been there? What’s good to eat there and what omiyage should I buy? What are the best sightseeing spots or hidden gems? Please do share your thoughts below, and join me next week for Japan by Prefecture! I live in Ehime, so hopefully I can recommend a few things! Most visitors purposefully travelling to the prefecture usually (and should) visit Matsuyama, the capital of the prefecture and also the largest city on Shikoku. It’s easy and cheap to get around thanks to the tram lines, and has probably the most well-known tourist draw of Shikoku – Dogo Onsen, the oldest onsen in Japan. There are actually two different baths inside, and depending on how much visitors want to pay, they can use one or both, as well as have the option of lounging around upstairs with tea and a snack and be shown around on a small tour of the baths used solely for visiting emperors. The covered shopping arcade leading down from Dogo Onsen is cool too; there are tons of shops selling local omiyage (mikan, mikan, and more mikan), and it’s got quite an old-timey atmosphere, especially since there are usually more than a few people strolling around in their yukata. Dogo Park makes for a nice visit too, especially in spring when the cherry blossoms are out. A shortish walk from the Dogo area is Ishiteji, temple number 51 of the 88 on the Shikoku temple pilgrimage. The temple’s relatively large in that as well as the main building, the grounds also contain several halls, a 3-storey pagoda, and even a smaller, sub-temple building connected to the main grounds via a cave! Both the cave and the inner temple are quite different to the style of the main part of the temple, and are well worth seeing. Finally in Matsuyama, there’s the obligatory castle. It’s one of the 12 original castles of Japan, and is quite unique compared to most other castles I’ve visited. Guests can even try on samurai armour for free inside on one of the floors. Ninomaru Garden nearby is worth a visit too, which is where the castle lord’s residence and offices used to be located. Aside from Matsuyama, any visitors looking for absolutely spectacular views and also an awesome bike trip should definitely travel the Shimanami Kaido. People can rent bikes and travel the 70km route, but you don’t have to travel the whole way by bike if you don’t want to – it’s by no means a very difficult bike ride, but a lot of people not used to biking/exercising prefer to do just one part by bike and then take a bus the rest of the way. There are terminals all along the way where people can pick up and drop off their rented bikes at any time. Top of the list should be the prefectural capital of Matsuyama, best known for its beautiful original castle and Dogo Onsen, one of Japan’s oldest hot springs. Uwajima, famous for Uwajima Castle, one of only twelve original castles remaining in Japan. Ozu City, a former Edo period castle town with an old samurai town and reconstructed castle. But the castles in Ozu and Imabari are also worth a visit!